Paula Radcliffe (coach: Gary Lough) suffered defeat on her return to racing this morning as Jo Pavey (coach: Gavin Pavey) stormed to victory in the Bupa London 10,000m, while a jetlagged Mo Farah (coach: Alberto Salazar) retained the men’s title with an easy win over domestic competition on a course which will form much of the London 2012 Olympic marathon route. Radcliffe was hoping for a victorious come-back in her first competitive appearance for 18 months, but the World Record holder was no match for Pavey who led from the start to take the UK 10km Championships title, also part of the runbritain Grand Prix. While Pavey powered home on a beautiful London morning in 32:22, a sore back left Radcliffe struggling to find her rhythm and the 37-year-old could only finish third in 33:17, 29 seconds behind Aviva GB & NI cross country international Gemma Steel (coach: John Nuttall). Radcliffe finished nearly three minutes outside her world best, clearly hampered by a lower back problem which flared up four weeks ago. While Radcliffe had a frustrating morning, Pavey enjoyed another morale-boosting performance following her 2:28:24 debut at the Virgin London Marathon six weeks ago when she pencilled her name in for Olympic selection. Pavey led from the start, but Steel made her move at half way, closing in on Radcliffe and moving into second before 6km. She quickly built a lead that Radcliffe couldn’t close and was delighted to finish runner-up, nearly half a minute ahead of her idol. “I saw Paula and I was starting to catch her, but I just couldn’t believe it and I didn’t know whether to pass her or not,” said the 25-year-old. “Paula is my idol so I just didn’t think I should be passing Paula Radcliffe. Radcliffe has already ruled out an appearance at this year’s World Championships in Daegu, and she will now seek treatment on her back before deciding whether – and where – to run an autumn marathon as she seeks the Olympic qualifying time. “I really wanted to come and run on this course and get used to it before the Olympics,” she said. “It’s such a great day and the atmosphere out there was fantastic, so I am really gutted. I just didn’t have the turnover at all. My breathing was fine, but my leg just felt a bit dead and there was no power. “Every time somebody passed me I kept saying ‘go with them, go with them’, and when Gemma passed I try to go with her but I couldn’t. It was all I could do to stay relaxed. Farah wasn’t quite at his best today, either. 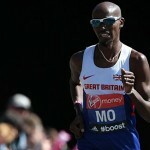 After twice breaking the British record on this course in the last two years, the 28-year-old was content to secure a third consecutive victory after arriving from his US training base only 24 hours earlier. He often leads from the outset, but he left it late this time, breaking clear from a leading pack of five with only a quarter of the race remaining to win in 29:15, more than a minute and a half outside his course record. London athlete Solomon Mehretab was the surprise package as he took second in 29:37, slicing 34s from his personal best, while US-based Scotsman Andrew Lemoncello (coach: Greg McMillan) overhauled Phil Wicks to finish third in 29:38. Eschewing his usual front-running tactics, he had set off with caution, tucking in behind Wicks – the early leader – in a large group of 14. Looking relaxed, he shadowed Lemoncello who made the first significant move after 4km as the leading pack was cut to five. They passed 5km in 14:42 with Farah on Lemoncello’s heels, followed by Wicks and Mehretab, and that group negotiated the tight corners through the City of London and past St Paul’s Cathedral before dipping back to Victoria Embankment. Farah made his bid for home emerging from the underpass beneath Blackfriar’s Bridge. Surprisingly, it was the little known Mehretab who stuck to the double European champion as Lemoncello and Wicks dropped back. 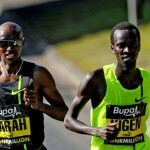 The two ran side-by-side through 8km (a 2:51 split) before Farah kicked clear.